Our 4 man urinal is free standing pod which are open to the elements. The 4 man urinal is ideal for any size event and can be implemented in groups. This can help to minimise queues and maximise delivery space. This is a cheap solution to providing toilet requirements when there is predominantly male participation. It helps alleviate traffic flow, eliminating the possibility of some males using an unofficial toilet area to relieve themselves! Depending on the size of your event, we also provide 6 man urinals, large urinal troughs and 20 man urinal trailer, we can even offer a mixture of these. We suggest that the urinals are shielded from public view and are stationed together. Ideally Heras fencing or similar should be used to make an enclosure, using a scrim covering to provide privacy. Why not take advantage of these fenced areas to attach messages from your sponsors, they might even offer to pay for the toilets if you are lucky! Please talk to our Events Sales Team about the hire of fencing. Alternatively if you are hiring traditional single cubicles we can arrange these to shield the pods for privacy. It may be achievable also with the use of walls on site or a combination of both. These units offer the ultimate in convenience and can be delivered in bulk as they stack, cutting down on transportation costs and also meaning that we can set up and get your toilet areas running very quickly. Made of strong ‘storm grey’ plastic, they will withstand just about anything. Should it be necessary, our service tank can empty the units on site, no other servicing should be required. 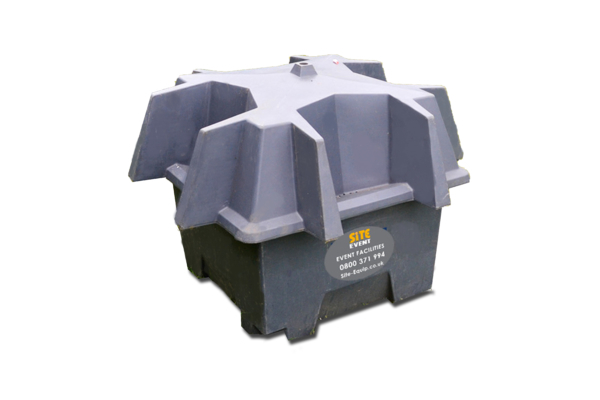 The pods are simplicity itself, with 4 shielded positions which drain directly into a holding tank of 550 litres capacity. We recommend hiring these open urinals for festivals, motor cross (or similar) beer festivals and large camping gatherings, or anything with an open air theme. They are certainly a back to nature provision for the man who is not too proud to visit an open air loo, whilst chatting to your companions and enjoying the fresh open countryside.